Pyotr Bagration[nb 1] (10 July 1765 – 24 September 1812) was a Russian general and prince of Georgian origin, prominent during the Napoleonic Wars. Bagration was born in Kizlyar or Tbilisi to a family, part of the Bagrationi dynasty. His father was an officer in the Imperial Russian Army, which Bagration also enlisted in 1782. Bagration began his career serving in the Russo-Circassian War for a couple years. Afterwards he participated in a war against the Ottomans and the capture of Ochakov in 1788. Later he helped suppress the Kościuszko Uprising of 1794 in Poland and capture Warsaw. During the Italian and Swiss campaigns of 1799 against the French, he served with distinction under Alexander Suvorov. In 1805, Russia joined the coalition against Napoleon. After the collapse of the Austrians at Ulm, Bagration won praise for his successful defense in the Battle of Schöngrabern that allowed Russian forces to withdraw and unite with the main Russian army of Mikhail Kutuzov. The combined Russo-Austrian army was defeated at the Battle of Austerlitz in December, where Bagration commanded the right wing against the French under Jean Lannes. Years later he commanded Russian troops in the Finnish War against Sweden and another war against the Turks in the Danube. During the French invasion of Russia in 1812, Bagration commanded one of two large Russian armies, the other commanded by Barclay de Tolly, fighting a series of rear-guard actions. The Russians failed to stop the French advance at the Battle of Smolensk. Barclay had proposed a scorched earth retreat that was approved by Alexander I, although Bagration preferred to confront the French in a major battle. Mikhail Kutuzov succeeded Barclay as Commander-in-Chief and continued his policy until the Battle of Borodino near Moscow. Bagration commanded the left wing, later called the Bagration flèches, at Borodino, where he was mortally wounded and died a few weeks later. He was originally buried at a local church, but in 1839 was reburied on the battlefield of Borodino. 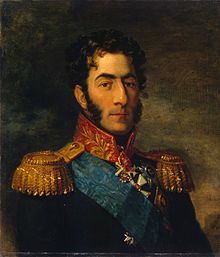 Pyotr was born in 1765 to a prince of the Mukhrani branch of the Bagrationi dynasty, Colonel Prince Ivane Bagrationi, who was the eldest son of Prince Alexander, an illegitimate son of King Jesse of Kartli, which is now central Georgia. He studied Russian and German and was taught Persian, Turkish, Armenian, and Georgian by his father. However, unlike many other Russian aristocrats, he did not know French. Bagration personally identified himself as a "pure Russian" (chistoi russkoi). Pyotr joined the Imperial Russian Army in 1782, enlisting as a sergeant in the Kavsansk Rifles of the Astrakhan Infantry Regiment. His younger brother Roman joined the Chuguevsk Cossack regiment as a uryadnik (a Cossack NCO) at the age of thirteen in 1791. Both would go on to become generals of the Imperial Russian Army. Bagration served for some years in the Russian-Circassian War. He participated in the Siege of Ochakov (1788). In 1792 he was commissioned as a Captain and transferred to the Kiev Cavalry Regiment that year as a second Major, transferring as a full first Major to the Sofiiskii Carabineers on 15 May 1794. He served in the military campaign to suppress the Polish Kościuszko Uprising of 1794. Catherine Pavlovna of Russia (left), a daughter of Emperor Paul I of Russia, was passionately in love with Prince Bagration. That worried the Russian royal family, and to avoid future relations between the two, the Emperor Paul forced Bagration to marry Princess Catherine Skavronskaya (right) in 1800. He was the alleged lover of Emperor Paul's daughter Catherine. In 1800 Paul recognized the title of "Prince (Knyaz) Bagration" for Pyotr in Russia, and unexpectedly married him off to Countess Catherine Pavlovna Skavronskaya, the favorite niece of Grigory Potemkin and one of the Empress Maria's ladies-in-waiting. Bagration and Catherine had been casually involved, but the marriage was a failure. The young and lovely Catherine soon preferred traveling and, in 1805, fled to Vienna, where her salon and running affair with Prince Clemens von Metternich—who called her "the Naked Angel"—permitted her to serve as an important agent of Russian intelligence and diplomacy. 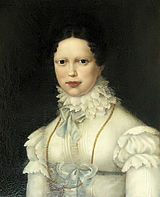 Bagration was obliged by the emperor to claim their daughter, Marie-Clementine, as his own and to subsidize thousands of rubles of Catherine's debts. He had a reputation as a heavy gambler, as well, and was forced to sell estates to cover losses that rose as high as 80,000 roubles. In the wars of 1805 Bagration's achievements appeared even more brilliant. When Napoleon ordered Murat to break an armistice he had just signed with Bagration, the general was able to successfully resist the repeated attacks of forces five times his own numbers under Murat and Lannes at Schöngrabern (16 November) near Hollabrunn. Though Bagration lost half of the men under his command, their stand protected the retreat of the main army under Kutuzov to Olmutz. When Kutuzov was overruled and forced into battle at Austerlitz (2 December), Bagration commanded the advance guard of the Prince Liechtenstein's column and defended the allied right against Lannes while the left attacked Napoleon's deliberately undefended right flank. He was promoted to Lieutenant-General in 1805, and in 1807 fought bravely and obstinately at the battles of Eylau (7 February), Heilsberg (11 June), and Friedland (14 June). He was successful as commander of both Russia's Finnish Campaign in 1808 and Turkish Campaign in 1809. In the former, he captured the Åland Islands by a daring march across the frozen Gulf of Finland. His rapid transfer to the distant Moldavian front against the Ottoman Empire has been seen as a reprimand for an alleged affair with the tsarevna Catherine, who was married off shortly thereafter. While there, he led the Russian army at Rassowa and Tataritza and was promoted to full General of Infantry. In 1812, Bagration commanded the 2nd Army of the West. A few days before Napoleon's invasion on 24 June, he suggested to Alexander I a pre-emptive strike into the Duchy of Warsaw. Defeated at Mogilev (23 July), Bagration led his forces to join the 1st Army at Smolensk under Barclay de Tolly, to whom he ceded overall command of both armies on 2 August. Bagration led the left wing at the Battle of Borodino (7 September) where he constructed a number of flèches which, due to a shortage of engineer officers, were poorly-built. During the battle he received a mortal wound and later died on 24 September, in the village of Simi, which belonged to his aunt. It is said that, while wounded, Bagration kept giving orders to the troops without knowing that the Russian army was abandoning Moscow. When he finally heard the truth, Bagration was so shocked that he rapidly stood up, totally forgetting about his grave wound. Such an act was too much for his severely wounded body and it quickly cost Bagration his life. In the course of the War of the Third Coalition, Napoleon's defeat of General Mack's Austrian army at Ulm on 19 October 1805 led Kutuzov to consider withdrawing and uniting his forces with reinforcements arriving at Brünn. Kutuzov ordered Bagration to guard Vienna with just a single regiment in order to stall a possible French assault. The French marshals Murat and Lannes made a false armistice claim to position themselves near the Danube at Vienna. When the guards were distracted they rushed over the bridge to secure the town. Kutuzov was in hurry to unite his army with the Russian troops commanded by Buxhoeveden, so he needed a diversion to delay the French advance. Bagration then took command of the Russian army's rearguard to do so. His combined Russo-Austrian force numbered less than 7,500 men facing a foe more than five times the size. Bagration took up a position 6 km north of Hollabrunn, on the hill north above the small town of Schöngrabern, and formed a huge line in order to trick the French into believing the entire Russian army stood before them. In fact Marshal Murat hesitated to attack and later even agreed to an offer from Bagration to negotiate an armistice, halting the entire French advance without informing Napoleon. This delay gave Kutuzov enough time to save his army. When word reached Napoleon he was enraged at Murat's obstinate behaviour and ordered him to resume the attack immediately, ending the armistice on November 16. The vanguard of Lannes's and Murat's 45,000 men attacked Bagration's position repeatedly but were repelled each time, unable to take the hill for some six hours. General Bagration personally led some of the counter-attacks, which drove the French back. 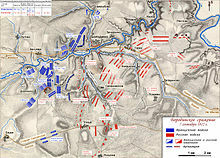 Even though his force suffered heavy casualties and total destruction seemed inevitable, Bagration managed to manoeuver his remaining troops out of the area and unite with the rest of the Coalition army at Brunn on 18 November 1805. His actions prevented the Russian army from being cut off and destroyed. Just two weeks later, on December 2, 1805, the opposing armies would meet at Austerlitz. This time Bagration assumed command over the Coalition army's 13,000 men strong right wing, opposing Lannes' equally strong French left wing. When the coalition army started to rout, Bagration too ordered his men to retreat after not achieving any progress against Marshal Lannes, who had the support of elements of Marshal Murat's forces, even though his men fought bravely and fiercely. The battle was lost at that point. While Bagration saw no other option but to commence a strategic withdrawal, Marshal Murat refused Lannes' suggestion to further pursue him so that his corps wouldn't suffer further losses. General Bagration demonstrated his skills as military commander particularly during the brutal Battle of Eylau which took place in East Prussia on 7 and 8 February 1807 during the War of the Fourth Coalition. After destroying the Prussian army at Jena (October 1806), Napoleon was pursuing Russian forces under Marshal Kamensky. In a series of inconclusive clashes the French did not reach their ultimate goal of destroying the enemy, while the Russians successfully continued retreating. However, on January 7, 1807 General Levin August, Count von Bennigsen assumed overall command of the Russian forces and carried out a successful surprise-attack on the French left wing against Marshal Ney and further against Marshal Bernadotte. Bernadotte managed to evade destruction by winning the Battle of Mohrungen (25 January 1807) and by retreating. Napoleon saw an opportunity to envelop Bennigsen's unprotected left wing by instructing Bernadotte to keep retreating and allowing his army to cut off the Russians from their own retreat. By a stroke of luck, a group of Cossacks intercepted a French messenger carrying Napoleon's orders to Bernadotte and quickly reported to General Bagration. Bagration then informed Bennigsen, who immediately halted his offensive and retreated. The French pursued, and after several engagements finally confronted the entire Russian army at Eylau on 7 February 1807. Bagration occupied high ground a mile in front of the town, facing Marshal Soult's IV Corps and Marshal Murat's cavalry. The combined French forces assaulted the plateau, but Bagration's heavily outnumbered troops repulsed them. The general demanded bitter resistance from his men in order to gain time for Bennigsen's heavy artillery to pass through Eylau and join the main Russian force. During the afternoon the French were reinforced by Marshal Augereau's corps and the Imperial Guard, making up about 45,000 soldiers in all. Under pressure from greatly superior numbers, Bagration finally conducted an orderly retreat to join the main Russian army. Russian forces under General Barclay de Tolly covered the retreat. Despite a clear numerical advantage, the French were not able to achieve a greater victory than eventually driving Bagration's small force off the plateau. Bagration's delaying action and skillfull withdrawal enabled the Russian army to escape destruction and consolidate for a decisive battle. In 1946, Soviet authorities renamed the town of Preußisch Eylau as Bagrationovsk in honor of Pyotr Bagration and of his remarkable skills as a tactician. 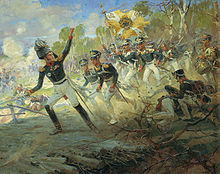 During the Finnish War from 1808 to 1809 Bagration commanded the 21st division of the Russian forces under Buxhoeveden. Not wanting to wait until Sweden had concentrated a large army in Finland, The Russian Empire took initiative and decided to take action. On the night of 9 (21) September (February 1808) Russian troops crossed the border to Finland and launched an offensive. Bagration's 21st division was forming the Russian center and moving ahead in order to quickly seize Hämeenlinna, Tampere and Pori. Under pressure of the swift advance, the Swedish forces began a hasty retreat to the depths of Finland and were pursued relentlessly. Bagration's men had to endure worst weather conditions, severe frost, snowstorms and forest debris. In addition the retreating Swedes were constructing obstacles and destroyed any possible food source as well as roads. Nevertheless, Bagration's division overcame those obstacles and took all objectives, Hämeenlinna on February 22 (March 6), Tampere on March 1 (13) and Pori on 6 (18) March 1808. Bagration managed to advance over a distance of 200 km and capture three cities in just eight days and securing the way to the Gulf of Bothnia. His manoeuvre split the Swedish forces in two, a northern and southern group, providing the Russians the possibility to strike each group one after another. Bagration correctly assessed the situation that the main Swedish force was in the north and intended to turn his division for an attack. But the commander in chief Buxhoveden foiled that plan by miscalculating the situation and assaulting the southern Swedish group, which had itself fortified in numerous fortifications, with his superior force, including the 21st division of Bagration. This allowed the main Swedish force to retreat unharmed to Oulu. Despite that Bagration himself still achieved success by capturing the strategically important Turku province. In September 1808 Bagration became ill and was forced to leave the theater of operation. He was keenly interested in the events and hastily returned as soon as he became fit for service again. Upon arrival he was appointed commander of the Russian forces defending the west coast of Finland. In September 1808 the Swedish command decided to land troops on Turku in order to distract attention from the northern Russian Front that threatened the Swedish main army and to secure the southern part of the west coast of Finland. A 2,500 men strong advance guard arrived at the Aland Islands and from there departed for the Turku coast. Bagration made a timely response and quickly threw the Swedes back to the sea. The Swedish leadership decided to take Turku at all cost to be able to create a bridgehead for reinforcements. King Gustav IV arrived at the Aland Islands to personally supervise the operation. On 14 (26) September a Swedish vanguard of 5,000 men was landing on Turku. Bagration was carefully monitoring the enemy's activities and allowed the Swedish troops to set foot on shore before he commenced a full assault which destroyed the entire enemy force, leaving only a few who could escape with boats. By the end of 1808, suffering heavy casualties, the Swedish troops were in full retreat and the area of Finland completely cleared of them. Despite those setbacks the Kingdom of Sweden was not ready to give up the fight. In 1809 the Russian command had decided to take the war to the territory of Sweden in order to finally crush her army for the conclusion. The Russian army was divided into three operational groups, that of Pyotr Bagration, Barclay de Tolly and Pavel Shuvalov [ru]. Bagration's 17,000 men strong corps consisted of 30 infantry battalions, four cavalry squadrons, 600 Cossacks and 20 guns. The main assault was to be carried out by him in one of the most daring marches in military history. 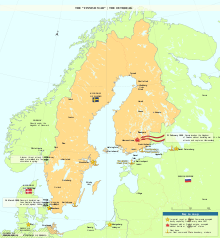 His route suggested to enter the frozen Gulf of Bothnia from Turku, reach and capture the heavily fortified Aland Islands which was garrisoned by about 10,000 Swedish troops and finally continue on the frozen Sea towards Stockholm. Knowing about the great difficulties he had to overcome, Bagration carefully planned his campaign and managed to supply his troops with fresh food, warm clothes, ammunition and weapons. The expedition was ready on February 26 (March 10) in 1809 and began on the next day. The offensive against the Alands was carried out in five attack columns, four engaged in a frontal assault, while the fifth bypassed Aland from the south. The Swedish troops did not put up much resistance and rather planned to retreat to the Big Aland from where they intended to stop Bagration's advance. In order to do so the Swedish commander general Carl von Döbeln decided to enter negotiations for an armistice. Bagration however refused, convinced that the sole purpose of von Döbeln's offer was to delay his movements and after completing negotiations, ordered his troops to advance at an even faster pace. Fearing an encirclement general von Döbeln started abandoning the Aland Islands and being pursued by Bagration's troops the retreat quickly turned into a devastating rout, leaving a lot of ammunition, weapons and equipment behind. Bagration calculated an intimidation manoeuvre, ordering a 400 men strong cavalry detachment under major general Yakov Kulnev to pursuit the Swedes beyond their own shores. Kulnev managed to take the Swedish town of Grisslehamn, which was just 70 km away from Stockholm. This unexpected turn of events brought shock and confusion to the Swedish leadership and population as everyone was surprised to hear of Russian troops on Swedish soil. Stockholm was being fortified, an army quickly put together and sent to intercept an enemy which wasn't actually there. The plan worked out beyond Bagration's expectations as the psychological impact of Kulnev's little incursion into Sweden turned to be very decisive for the course of the entire war. Simultaneously the other Russian corps also reached their goals so that the Swedish side found itself in an environment of being forced into peace talks after losing all their claims in Finland. Gaining wide reputation for his actions in that conflict Bagration was promoted to full general of infantry. During the early stage of Napoleon's incursion into Russia, Bagration commanded the 2nd Russian Army deployed close to Vileyka, Belarus. The French march on Vilnius intended to split Bagration's forces from Barclay de Tolly's, who assumed overall command. Napoleon would then destroy Bagration's 2nd army with a combined hammer and anvil operation conducted by the Marshals Jerome, Davout and Eugene after he falsely assumed they ran into Bagration's army when it were only elements of General Dokturov's cavalry. Confusion, false assumptions and lack of information prevented the French from having a clear picture of the situation. On the other side it was not much better. Conflicting orders and lack of information had almost placed Bagration in a blind march straight into Davout's forces. Mud tracks, supply problems, weather and command dispute among the French gave Bagration enough time to join with Docturov and assume command over a 45.000 men strong force. With already losing a large portion of his troops to skirmishes, bad weather condition and diseases, Marshal Davout didn't want to fight Bagration without Jerome reinforcing him. The French cavalry was defeated twice by General Platov so that they were kept in the dark. Bagration wasn't better informed with both sides overestimating the other's strength. Davout thought Bagration had some 60,000 men and Bagration thought Davout had 70,000. Bagration was getting orders from both Alexander's staff and Barclay (which Barclay didn't know) and left Bagration without a clear picture of what was expected of him and the general situation. This stream of confused orders to Bagration had him upset with Barclay which would have repercussions later. 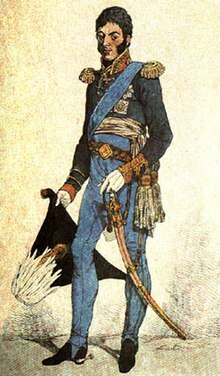 Even though Barclay de Tolly was given overall command as minister of war, Bagration was not subordinate under him since he was the older general. This is a reason why he constantly received orders from Tsar Alexander and Barclay at the same time. Despite massive losses among the French, their rapid advance by force march towards Moscow repeatedly prevented de Tolly to establish a defensive position and was forced to retreat every time he intended to. The commander in chief refused to put up a fight despite Bagration's numerous urging. De Tolly's continuing resistance to give battle would later lead to his removal from his position. The battle of Mogilev, better known as Battle of Saltanovka was the result of Bagration's unsuccessful attempt to unite with the Russian main army after he had suggested a pre-emptive strike on the French to tsar Alexander. His 2nd army got intercepted when trying to reach Barclay de Tolly's 1st army and clashed with Marshal Davout's forces at the Dnieper river. In order to break through the French lines at Mogilev, Bagration deployed the 20,000 men strong 7th corps led by General Nikolay Raevsky. On the opposing side marshal Davout's corps consisting of five divisions with a total strength of 28,000 men had formed defensive lines around Saltanovka. Davout waited for the approaching Russians and set them under massive musket volleys and artillery fire. Raevsky continued the advance personally leading his men in the assault. Despite great determination of the Russian troops, the French managed to repel the attack along the entire line. Davout then mounted a counter assault which threw the 7th corps back, although Raevsky was able to fend them off repeatedly until Bagration decided to order a general retreat when his army got also struck by other French forces at the flanks and rear. In order to avoid complete envelopement he quickly withdrew to Smolensk. Both sides suffered heavy losses, but Bagration misjudged the situation, believing he fought Napoleon's main army when it was only Davout's forces and some reinforcement. This highlighted the poor communication between the Russian armies. However at the same time Bagration's decision to withdraw thwarted Napoleon's plan to destroy the Second Western Army and he was eventually forced to fight a unified Russian force at Smolensk, which is what happened because Bagration fearing another attack, retreated to Smolensk and waited for Barclay to reinforce him. On August 14, 1812, the three Marshals Murat, Davout and Ney crossed the Dnieper River on quickly constructed pontoon bridges. The plan was to race toward the city of Smolensk, taking it without a fight. Napoleon saw Smolensk as a vital supply and replenishment base from where he would march to the north to attack the rear of the Russian main forces under Barclay de Tolly. The town had also symbolic, religious importance for the Russian side. Unfortunately for the French, conflicting orders and a breakdown in communication had already led Bagration to disobey orders and instead of marching west, he occupied Smolensk to the south. By August 16, French forces found the city heavily garrisoned by Bagration's troops. He got further reinforced with the arrival of de Tolly's army. Napoleon, however, assumed the Russians would fight outside the city to avoid the destruction of historical monuments, which did not happen. The fight for Smolensk started on August 16, 1812 with Napoleon's forces of three corps capturing parts of the town's suburbs but being repelled soon after. Continuous artillery shelling set the town, which consisted of mostly wooden buildings, ablaze, but the French didn't manage to get past the suburbs and to the walls as they lacked ladders and other equipment. Inflicting heavy losses on the attackers, the Russian garrison was able to hold its positions. However, the widespread fire forced Bagration and de Tolly to abandon burning Smolensk on August 18, 1812. The battle ended inconclusively, with the Russian armies retreating and Napoleon conquering but as quickly leaving what was left of the city as it was of no use anymore. To Vice-Colonel of Akhtyrsk Hussar Regiment Davydov. After reception of this, take hundred fifty Cossacks from Major-General Karpov and fifty Hussars of the Akhtyrsk Hussar Regiment. Bagration than also wrote letters to General Vassilichikov and General Karpov regarding the allocations and general information about the best Cossack and Hussar units available. On the request of Davydov he provided the vice colonel a copy of his map of the Smolensk province and when parting wished the young officer the best of luck, and also hoped for his success. His confidence would soon be emphasized when the guerilla movement developed wide scope. Soon, besides Davydov's movement, other groups emerged: those of General Dorokhov, Captain Fisher, Captain Seslavin, Colonel Kudashev and many others. These groups successfully strove against the French, combining their activities with those of peasant guerilla groups. Bagration became the author of the first real tactical instructions for such activities and one of the founders of the Russian guerilla movement against Napoleon. An awful combat took place in which, on both sides, miracles of almost supernatural bravery were displayed. The infantry, cavalrymen, and gunners of both sides, having got mixed up together, presented an awful spectacle of the great bulk of soldiers struggling in private, furious despair. Bagration ordered his entire force to counterattack, but was seriously outnumbered and slowly driven back. The French 57th Line Infantry Regiment kept attacking the flèches, even though it was almost completely torn to pieces by musket fire from all directions. Their courageous behaviour earned two "Bravo" shouts from Bagration, and it was then that the 2nd commander-in chief was struck by shell splinters in his leg. His subordinates quickly carried him to a safe place away from the fight while trying to conceal what had happened, but Bagration's absence was soon noticed. Rumours of him being killed spread and the morale of his troops began to increasingly waver. Bagration, now unable to control the situation, insisted on not being moved from the field until the battle was decided, hoping for the success of the 2nd Cuirassier Division of General Duka. The Cuirassiers managed to defeat the forces of Marshal Ney but the news of Bagration being hit quickly spread and brought confusion and morale collapse within the 2nd Army. Its management broke down so that the Russian forces were starting to abandon their positions in the chaos and to retreat from the overwhelming French assault. The Bagration flèches were abandoned and left to the French, but it had cost them a huge price. From the 60,000 French soldiers who participated in the operation, about 30,000 were killed or wounded. Russian casualties were also high, but fewer. The battle, however, ended inconclusively, with both sides returning to their initial deployment zones. The battle drained from Napoleon his last fighting capabilities and resources and finally forced him to abandon his plan of capturing Russia when he entered an empty Moscow. Bagration, heavily influenced by Alexander Suvorov, was an innovative tactician who favoured mobile offensive warfare even though many of the battles he was engaged in with the French were of a defensive nature. He refused what he perceived as obsolete positioning tactics and instead would give the Russian army strategic objects and tactical manoeuvers, always going for the quick confrontation, where speed and accuracy were most important, to deny the enemy any chance to react, respond or even organize. This led to much tension and rivalry between him and general Barclay de Tolly, who was given overall command and relied mostly on the search for adequate positions to entrench and wait for the enemy. Bagration's applied doctrines were ahead of time solid concepts for both offensive and defensive warfare, as even his retreats were conducted in equally good and impressive fashion, given the sometimes impossible odds he was facing. For us, it is necessary to attack them bravely, quickly, not to become engaged in shooting matches; artillery must fire precisely, irregular armies must try to surround their flanks and rear…. The regular cavalry attacks quickly, but as a part of concerted action, without dividing into small bodies. Squadrons must support each other in the attack, not forgetting to provide for reserves and flanks. The cavalry should be located under the chess order. Commanders of Corps must try to turn all attention to attacking the enemy with bayonets, using columns, and to attack until the enemy retreats. The horse artillery should operate energetically, as should cavalry, but harmoniously and without the slightest confusion. It is especially necessary when the enemy has strong reserves and may frustrate our attacking forces; for that we must try to have our forces in columns and in readiness, and as soon as everyone is driven into flight, then the Cossacks must prick and harass them, with the regular forces in close and harmonious support. Bagration recommended deployment of the forces in a battle array that was not too closely packed, but sufficiently so to permit soldiers to feel each other's presence with their elbows. In case of counter-attacks by enemy cavalry, Bagration advised the use of battalion masses and squares, or "carrés". "When the enemy cavalry attacks infantry, it takes only a minute to form either a column closed on all sides, or a battalion in a 'carré'." With the purpose of increasing the enthusiasm of armies, all attacks were to be made with a shout, and during the approach the drums were to be beaten and music to be played. Similar insights are reflected in a number of Bagration's other orders, instructions and letters. In particular, as the characteristic of his tactical perspective, the "Manual for Infantry Officers on the Day of Battle" may serve as an example. This document was prepared on the basis of the "Manual to Officers of the Narva infantry Regiment," authored by M.S. Vorontsov in 1812. According to military historian P. Simansky, Vorontsov's manual "was strongly influenced by Suvarov's precepts, and was appraised by the most favorite disciple of Suvarov, Prince Bagration; it was slightly corrected by him, as in some places it concerned only Narva infantry Regiment, and then in July 1812 it was dispatched to all units of the 2nd Army." The "Manual to Infantry Officers on the Day of Battle" recognized the offensive as the fundamental form of combat. The principal manifestation of offensive combat was the bayonet attack, concluded with a vigorous pursuit of the defeated enemy. This manual considered in detail the question of action in separate lines and in columns and about conducting aimed fire. The necessity of maintenance by skirmishers of a close communication with their columns was specified; movement forward was to be determined only by an order of the chief of division or battalion. If it was necessary to operate on separate lines in forests, it was suggested to hold a reserve behind one of the flanks in order to have an opportunity to suddenly envelope the flank of a counter-attacking enemy. Attacks by enemy cavalry acting in separate lines were to be met by fire, having permitted the enemy to advance to within 150 paces; after that it would be necessary to divide into small groups of ten and to repulse the enemy by fire and bayonets until the approach of reinforcements. Upon approaching, reinforcements were to be redeployed from a column into square, firing on enemy cavalry from a distance of 150 paces. The "Manual" demanded that officers demonstrate constant care for their soldiers, to remind them of their duties and their oath, to explain what was required from them during military actions. Special attention was addressed to the maintenance of trust in the virtue of "Russian bayonets", a spirit of boldness, courage and persistence in the fight. "Persistence and courage," declared the "Manual", "have won more battles than all other military talents taken altogether." Dissemination of all rumors of disaster and panic, such as "We are cut off! ", were categorically forbidden, under the threat of severe punishments. It was specified in the "Manual" that: "Brave people are never cut off; wherever the enemy goes, turn your breast to follow and defeat him." Thus, in the field of tactics, as well as in the field of strategy, Bagration acted as an innovator, a convinced supporter of decisive offensive action. He doggedly introduced advanced tactics; he dispensed with obsolete positional tactics and applied tactics of columns in a combination with separate lines. Paying great attention to the value of offensive combat, Bagration at the same time did not reject the opportunity to conduct defensive operations. He creatively approached planning for his assigned tasks, applying such forms of combat as provided exactly the right answers to particular circumstances. His practical legacy offers experience rich in the conduct of offensive battles as well as the development and practice of waging both advance and rear guard fights. Bagration was the unsurpassed master of organization of these extremely complex kinds of action. It was not by chance that, at the most crucial moments of the wars of 1799–1807, it was Bagration who was appointed to command the rear guards and advance guards of the Russian Army. The engagements conducted by Russian armies under Bagration's leadership during the Italian campaign of 1799, and also the advance and rear guard combats during the Swiss Campaign of 1799 and war between of Russia and France in 1805–1807, belong among the finest accomplishments in Russian military art. Bagration built a process of education and training of soldiers on the basis of the system developed by A.V. Suvorov. He paid great attention to the training and education of troops to develop soldiers with courage and initiative, capable of carrying out orders quickly and skillfully. ... I visited several times an avant garde where many of my friends were serving at Prince Bagration's headquarters. The hospitable manner of the Prince with subordinates, amicable relations between themselves, harmony, cleanliness in tents, the fresh and pleased appearance of the lower grades, proved the Prince's good treatment and attitude toward them, and in all hearts the pledge of general trust in him. While showing a concern for the soldiers, however, Bagration at the same time demanded the maintenance of high military discipline, considering it to be the foundation of military service. "In military service," he wrote, "the first objective is order, subordination, discipline, unanimity and friendship". First of all, Bagration was extremely demanding of himself. "...To execute the will of the sovereign, of the emperor and my commanders is the most sacred obligation which I follow and obey at every step of my service... I love soldiers, I respect their bravery, and equally I demand order and discipline." Armies under Bagration's command were always distinguished by high discipline and, in some sense, this was one of the main reasons for their brilliant victories over their enemies. On 15 October 1800, Bagration was granted the hereditary title of a Prince of the Russian Empire (Kniaz Bagration) by the Emperor Paul I. He was also appointed as a Knight of the Orders of St Andrew (1810), of St. Alexander Nevsky (1807), of the St Vladimir, 1st class (1809), of the St Anna, 1st class (1800), the St George 2nd class (1805) and as a Commander of Justice of the Order of St John of Malta (1800). He was further honoured with a gold sword of honour for bravery (1808). Bagration's foreign awards also included the Prussian Orders of the Red Eagle (1807) and the Black Eagle (1807), the Austrian Military Order of Maria Theresa, 2nd class (1799) and the Sardinian Order of Saints Maurice and Lazarus, 1st Class (1799). He is portrayed with a supporting role in Tolstoy's epic novel War and Peace. Tsar Nicholas I had a monument erected in his honour on the battlefield of Borodino. The general's remains were transferred to the place where he had fallen and remain there to this day. The grave was blown up during World War II (reputedly, the local museum authorities were able to save only shreds of bone and cloth from the grave) but has since then been restored. Joseph Stalin chose Bagration as the name of the Soviet offensive launched on 22 June 1944 that defeated the German Army Group Centre and drove the forces of Nazi Germany out of what is now Belarus. After the war, the Soviet Union annexed northern East Prussia, and the until-then German town of Preußisch Eylau—the scene of the 1807 battle—was renamed Bagrationovsk in his memory. In Moscow, the Bagration Bridge, which commemorates the 850th year of the city is named in his honour. An asteroid 3127 Bagration and Moscow Metro station Bagrationovskaya are named after Prince Bagration. ^ The Russian form of his name, Pyotr or Pëtr Ivanovich Bagration (Пётр Иванович Багратион), includes a patronym based on his father's name Ivane. The Russian surname is pronounced [bəɡrɐtʲɪˈon]. His title "prince" translates as the Russian title knyaz. In English, it is also alternately pronounced /bəˈɡreɪʃən/ bə-GRAY-shən or /bəˌɡrɑːtsiˈoʊn/ bə-GRAHT-see-OHN. His name in Georgian was Petre Bagrationi (პეტრე ბაგრატიონი), pronounced [baɡratiɔni] with no significant stress. His title "prince" translates as the Georgian title batonishvili. ^ a b Mikaberidze (2009), Ch. XIII: Bagration—"God of an Army". ^ Dumin (1996), pp. 44 ff. ^ Mikaberidze (2009), p. 8. ^ Mikaberidze (2009), p. 7. ^ Mikaberidze (2009), p. 734. ^ Norris & Sunderland (2012), p. 94, 95. ^ a b c d e f g h i j k EB (1878). ^ a b c Mikaberidze (2009), Ch. XI: Withdrawal from Smolensk & a Change of High Command. ^ a b Mikaberidze (2009), Ch. XII: Borodino—The Final Glory. ^ Danilewsky & al. (1840), p. 201. ^ Mikaberidze (2009), Ch. I: The Early Years. ^ a b Mikaberidze (2009). ^ Mikaberidze (2000), Ch. 2. Wikimedia Commons has media related to Pyotr Bagration. Marek, Miroslav. "Genealogical account of Bagration's family". Genealogy.eu.